August 11th 1973. Like any style of music, hip hop has roots in other forms, and its evolution was shaped by many different artists, but there’s a case to be made that it came to life precisely on this day in 1973, at a birthday party in the recreation room of an apartment building in the west Bronx, New York City. The location of that birthplace was 1520 Sedgwick Avenue, and the man who presided over that historic party was the birthday girl’s brother, Clive Campbell—better known to history as DJ Kool Herc, founding father of hip hop. 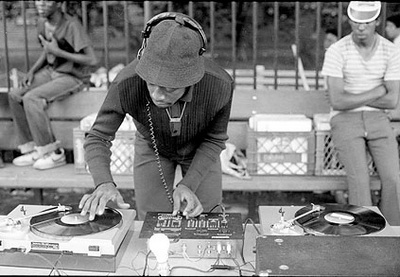 DJ Kool Herc’s signature innovation came from observing how the crowds would react to different parts of whatever record he happened to be playing: “I was noticing people used to wait for particular parts of the record to dance, maybe [to] do their specialty move.” Those moments tended to occur at the drum breaks—the moments in a record when the vocals and other instruments would drop out completely for a measure or two of pure rhythm. By the summer of 1973, DJ Kool Herc had been using and refining his break-beat style for the better part of a year. His sister’s party on August 11, however, put him before his biggest crowd ever and with the most powerful sound system he’d ever worked. It was the success of that party that would begin a grassroots musical revolution, fully six years before the term “hip hop” even entered the popular vocabulary.